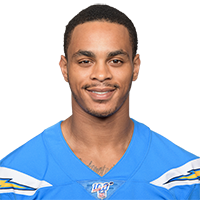 Patton signed a futures deal with the Chargers on Monday, Ricky Henne of the Chargers' official site reports. Analysis: Patton has spent the past two seasons on the team's practice squad, impressing in both preseasons. He recorded nine receptions for 75 yards and one touchdown in the 2018 preseason. Patton was waived by the Chargers on Saturday, Ricky Henne of the team's official site reports. Analysis: Patton will join the Chargers' practice squad after clearing waivers, so there's a chance he gets called up to the active roster later this season. There are no videos available for Andre Patton. Click here to view all videos.